Just two days after fellow 1994-95 co-Rookie of the Year Grant Hill retired from basketball, former Dallas, Phoenix, New Jersey and New York point guard Jason Kidd has announced his own retirement. The 10-time All-Star turned 40 in March and suffered through a rough postseason run with the New York Knicks earlier this spring. He signed a surprising three-year deal with New York in 2012 to help steady the team’s backcourt until 2015, but as the 2012-13 season wore on it became more and more apparent that Kidd’s time in this league was running out. It was in sharp contrast to the brilliant career that preceded this up-and-down season. Too often Kidd’s fantastic work came in concerts with caveats about what he couldn’t do – Jason was an iffy perimeter shooter for many years and his defense fell off toward the end – but his time in the NBA was as impactful as any of his contemporaries, spread out over nearly two decades. Kidd’s ability to push the ball and take chances with both passes and transition finishes were in stark contrast to the slowed, half-court style of ball that ruled the airwaves during the better part of his time in the pros. One of the great rebounding guards in NBA history, Kidd’s ability to gather a defensive carom and lead the break made playoff participants out of the Suns, conference champions out of the Nets and an NBA Finals winner out of the 2010-11 Dallas Mavericks. Dallas was the franchise that drafted Kidd, though it later soured on him after a series of coaches (and their requisite philosophies) matched with an uneasy pairing of Kidd with fellow lottery picks Jamal Mashburn and Jim Jackson to create more lottery appearances (with picks used on Cherokee Parks and Samaki Walker) during Kidd’s first two seasons. In the pre-Mark Cuban era, the Mavs’ front office was a mess – the team hired Jim Cleamons to run the triangle offense with Kidd as its lead guard, something that was never going to work, before dealing Kidd to the Phoenix Suns just two months into his third season with Dallas. 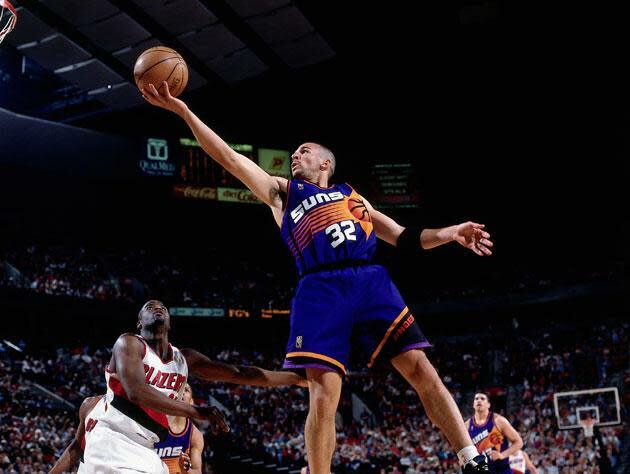 Plucked down into one of the most entertaining teams of the entire decade, Kidd immediately dragged the 1996-97 Suns (who also began the year attempting to run the triangle offense, starting the season 0-13) out of the muck. The Suns went 32-23 with Kidd running the team’s small-ball offense, making the playoffs in the first of five consecutive postseason runs in Phoenix. Kidd's off-court issues and clashes with coach Scott Skiles led to Suns general manager Bryan Colangelo dealing Kidd to the New Jersey Nets for Stephon Marbury in 2001. The Nets also added a series of young contributors and full healthy years from Kenyon Martin and Kerry Kittles, setting the stage for Kidd to lead the much-improved team out of the lottery and into the NBA Finals. The team would return to the Finals again in 2003, but this was at the apex of the Western Conference’s one-sided dominance over Eastern teams, and Kidd’s Nets only managed two wins in 10 Finals contests. The team soldiered on, adding Vince Carter and continuing to make the postseason, but by 2008 it was obvious that New Jersey needed to rebuild (a process that took four full years), and Kidd was shipped back to Dallas. By now Kidd’s all-world defense had faltered a bit, but he remained a magician at seeing angles that the defense created and leading Dallas’ fabulous delayed transition attack. With Dirk Nowitzki and Jason Terry needing the ball to score on their own, Kidd’s assist totals dipped, but he remained a killer hockey assist artist, while staying active in passing lanes and off the ball. Kidd wasn’t an All-Star by the time he became a champion in 2011, but his presence on that Mavericks team was key on both ends of the ball. The trip to New York in the summer of 2012 was another uncomfortable parting, and while Kidd seemed to be working his way into turning into a 3-point sharpshooter early this season, his footwork failed him and he made fewer than one-third of his long range shots following December. The playoffs were even worse, as Jason missed 22 of 25 attempts from the field, sometimes embarrassingly missing the sort of front-of-the-rim transition lay-ups that used to be his go-to move. There was always the chance he could rebound from the slump in time for 2013-14, but it appears as if Kidd has had enough. And it appears as if Kidd and Grant Hill, linked at the arm since sharing that Rookie of the Year trophy in 1995, will be hitting the Basketball Hall of Fame at the exact same time. Fitting, for two players that did their best to provide high-end entertainment during the drudgery that sometimes was 1990s NBA basketball.